Zacharias Trust are hosting the biggest REBOOT yet in London this September - aimed at answering the tricky questions 12-18-year-olds ask in trying to make sense of faith in God today. Being a parent brings many challenges, not least the need to answer all sorts of random questions that our kids dream up. Some of them, like “Can I eat ice cream for breakfast?” can always be answered with a sure-footed negative, while others such as “Why is the sky blue?” might send us scurrying to get help from Google. The good news is there are answers for such big questions, answers that are intelligent, thought-through and compelling, answers that can help strengthen teenagers’ faith in Christ. 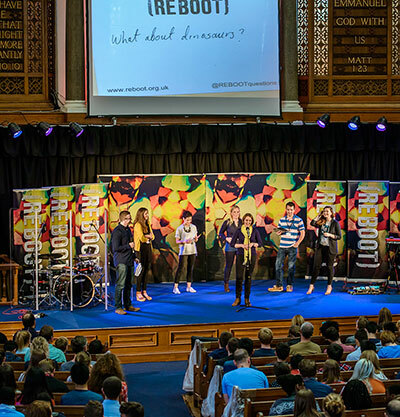 REBOOT London is an event all about answering the deep and difficult questions of 12 to 18-year-olds who are trying to work out what faith in God and being a follower of Jesus means for them. It’s an interactive day of short talks, interviews and lots of Q&As organised by the Zacharias Trust, an Oxford-based charity that seeks to show there are meaningful and credible answers to people’s intellectual objections and heartfelt concerns about Christianity. REBOOT is built around the premise that no question is off limits and teenagers are invited throughout the day to use their phones to send in questions and to vote for the ones they most want answered. Amy Orr-Ewing, one of the event’s founders, said, “REBOOT is designed to be a space for young people to articulate their questions and doubts about God and the Christian faith, the kind of questions that they get asked at school. “We noticed about five years ago when we were involved in a lot of university evangelism that it felt like we were opening the front door and hundreds and thousands of students were coming to Christ on campus. Since it started in 2013 in London, REBOOT has grown into a worldwide phenomenon, answering thousands of teenagers’ questions via events in Australia, Belfast, Canada, Edinburgh, Hong Kong, Peru, South Africa, Spain, and the US. Last year’s REBOOT London attracted around 1,000 young people and this autumn’s event will be the biggest yet, taking place in Westminster Central Hall on Saturday 22 September, with special guest Louie Giglio.